2017 Smart Fortwo Cabrio Electric Drive review – price, specs and release date | What Car? 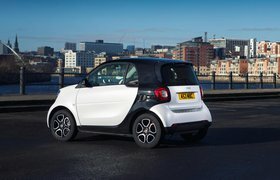 Is the Smart Fortwo Cabrio Electric Drive the ideal companion in a city? On first appearances, it seems that way. Its electric powertrain makes it extremely cheap to run, and if you’re always close to a power source, worries about charging needn’t be an issue. And with its compact dimensions, parking, manoeuvring and nipping in and out of tight gaps is a doddle. What’s more, the fabric folding roof means that when the sun does come out, you can take full advantage – and with weather as it has been in the last few weeks in the UK, that gives the Cabrio Electric Drive an appeal all of its own. Believe it or not, the Cabrio Electric Drive is the only fully electric convertible for sale on the UK market today. It’s powered by an 81bhp electric motor, which gives it an official range of 96 miles, although in the real world that’s likely to be closer to 70. And from spring next year, you’ll be able to purchase a fast charger to install at your home that can charge it up to 80% of its battery capacity in less than 45 minutes – although if you charge it from a normal wall socket, it’ll take six hours. Prices for the Fortwo Cabrio Electric Drive start at £18,560 after the £4500 government grant for zero-emission vehicles, meaning you pay a £2140 premium for that opening roof compared with the hard-top Coupé. When you consider what else can be had for that sort of money, it does make the Electric Drive feel rather steep. ‘Wheeeeee’. That’s your immediate thought when you first squeeze the accelerator pedal of a Smart Electric Drive from a standstill, because the response is immediate, and seamless, thanks to the automatic, gear-free drivetrain. And in this Fortwo Cabrio, on a warm day, you get the added thrill of the wind in your hair, plus you can just hear the futuristic whirr of the electric motor doing its thing – although compared with a traditional petrol or diesel-powered car, engine noise is notable by its absence, leaving you with a delightfully tranquil driving experience. It’s a heady combination, and one which is very appealing. 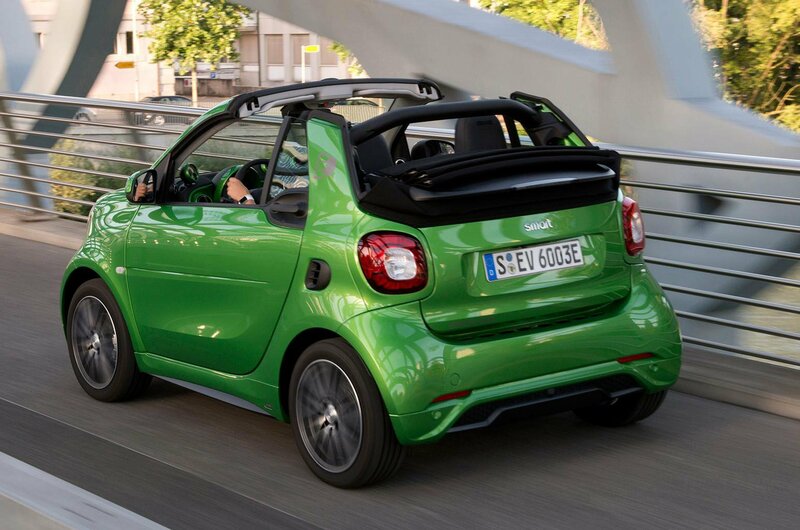 But as with all Smarts, the Fortwo Cabrio Electric Drive is happiest around town, and gets a bit flustered if you try to take it out on the motorway. Top speed is limited to 80mph, to make sure you don’t drain the battery too quickly, but the Electric Drive accelerates smartly (pardon the pun) from rest as, like all electric cars, it delivers most of its accelerative force from almost a standstill. The 0-62mph sprint takes a while, mind you – 11.8sec. The good news is that, as with the Coupe, the Electric Drive is the best version of the Smart Cabrio to drive, because the big battery, which is mounted low down in the car, lowers the centre of gravity and combines with firmer suspension to keep things more controlled. As a result, the Smart never feels as though it’s about to topple over, and even when you’re feeding it through twisting bends at a fair old lick, it remains stable and grippy, which means it’s actually surprisingly decent fun. 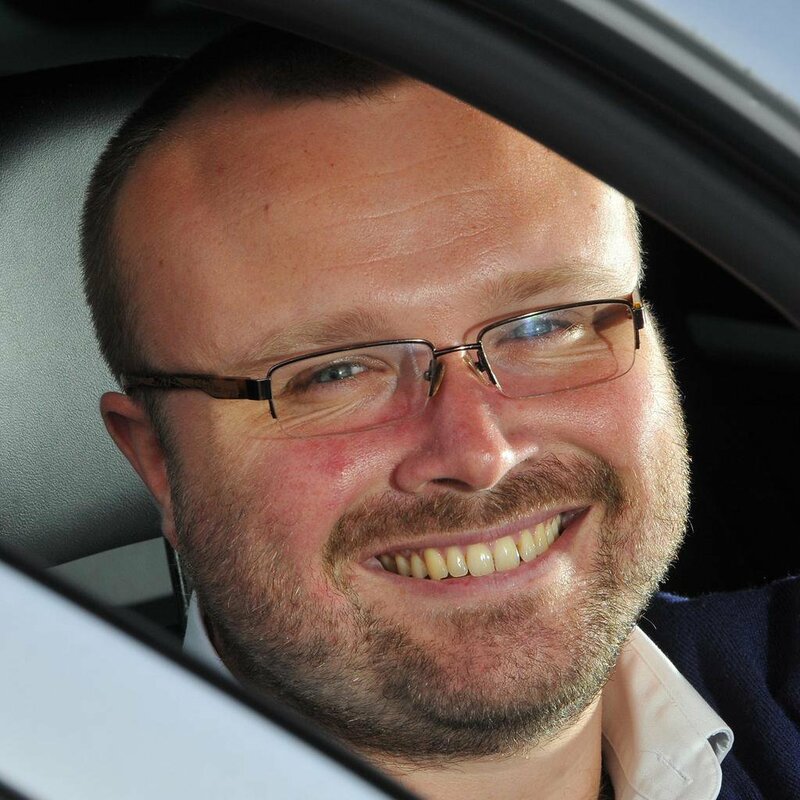 It rides reasonably well, too, although rougher road surfaces can generate a pronounced shudder through the car and the steering wheel, and the tiny distance between the front and rear axles means the Smart hops and jumps over larger lumps in the road. On the plus side, light steering and the Fortwo’s dinky dimensions make it an absolute doddle to drive. In town, the tiny turning circle – which is the same as in the petrol-powered version – means turning round is the work of a moment, while you can jink around tight turns and into gaps a larger car simply couldn’t squeeze through. 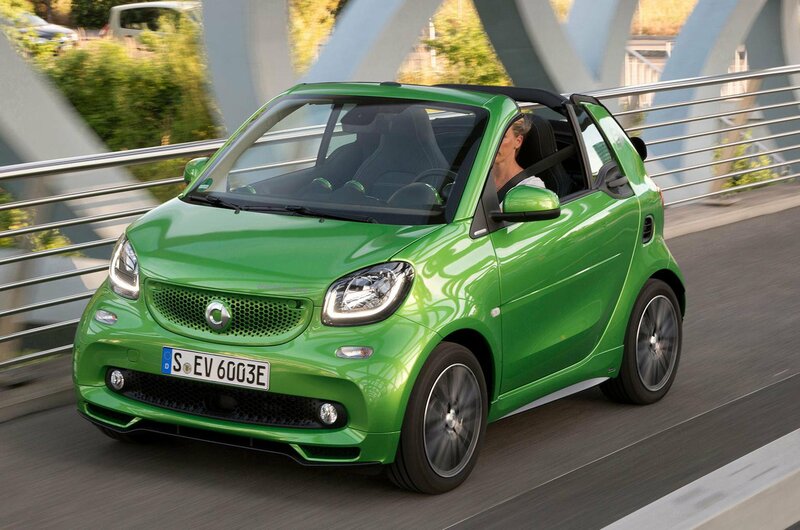 If you’ve ever seen the interior of a standard Smart Fortwo Cabrio, the Electric Drive will be very familiar. The only real change is the addition of a gauge which shows you how much charge you have left. Otherwise, you get the same dashboard, which is neatly designed and finished in bright colours and unusual textures, and while a few of the plastics lower down feels a bit cheap, everything else is sturdy and robust. The biggest drawback, of course, is the fact that, as its name suggests, the Fortwo only seats two people. And while both of those people will have plenty of space, the passenger loses out slightly on leg room thanks to a shorter footwell. Storage for odds and ends could also be better – there are huge door bins, capable of taking a litre bottle of water each, but the glovebox is tiny, and while there’s a neat drawer in the side of the centre console, this is on the small side, too. Because the battery in the Electric Drive is mounted below the seats, it doesn’t impact on the boot space. However, don’t think that means it’s spacious – there’s just about enough room for a couple of overnight bags, but no more. To make matters worse, the convertible roof makes the boot opening narrow; it feels like you have to post your luggage through into the boot. Also, when you have the roof bars removed for the full convertible experience, they’re stowed in the boot lid, which further reduces both luggage space and access. Only one trim level is being offered, which is based on the well-equipped Prime version of the standard petrol-powered car. That means you get heated front seats, cruise control, leather upholstery and 15in alloy wheels. In addition, Electric Drive models have charging cables for both domestic sockets and public charging stations, rear parking sensors, a touchscreen display with satellite navigation, and an ambient sound generator, which alerts pedestrians to the car’s presence.